A little while ago I saw the Amazon Echo Dot go on sale. Regularly $49.99 it was on for $39.99 and I couldn't resist. For those not familiar, Amazon makes 3 stand-alone devices, the Echo, the Tap, and Echo Dot. The Echo is an Alexa-enabled device with full voice control and speaker which apparently sounds pretty good when playing music. 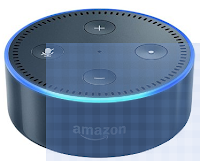 The Echo Dot Is the least expensive and smallest of the devices. It gives you all the features of the full Echo but the built-in speaker isn't great for listening to music. Fortunately you can connect bluetooth speakers to it, or plug it in to a home stereo using a 3.5mm headphone jack connector. All devices give you the power of Alexa on demand. At first I thought Alexa would just be a fun gadget for streaming music, setting alarms, or answering trivia questions, but I'm finding I use her constantly. Alexa has an ever-growing list of "skills" (Apps really) that allow her to interact with different devices. I was excited to learn I could connect Alexa to my Wink home automation hub and my Nest thermostat. Suddenly I could control the lighting and temperature in the house just by talking to Alexa. This included automating several functions at once. At night once the kids are in bed I sit on the couch and say "Alexa turn on watch TV". Alexa turns off the lights in the hallway and the kitchen, and dims the lights in the family room for a more pleasant viewing experience. All done and time to head to bed? I just say "Alexa activate night mode" and she turns off every connected light in the house as I go upstairs. Yesterday I bought a couple of TP-Link WiFi Light Switches thinking they would work with my Wink. They don't, at least not yet, but it turns out I'll be keeping them anyways. They may not talk to the Wink but they do talk to Alexa, and Alexa has no problem combining them in to groups with devices controlled by the Wink. This means my non-Wink devices are still able to be a seamless part of my home automation thanks to Alexa. The kids enjoy Alexa too. When my 6yr old found out Alexa would sing "Happy birthday" to her on demand she was tickled. Alexa is handy for recipes and makes an excellent bartender, tell her the drink you want and she will tell you how to make it. Of course Alexa will let you order things from Amazon as well, although you can disable that if you don't want to risk your children buying anything they feel like just by asking Alexa for it. Alexa does have some skills I wouldn't suggest. There is a skill to control my Luma mesh home wi-fi system, but the idea that the kids could disable their internet time restrictions or content filters just by telling Alexa to doesn't seem like a great plan. Needless to say that skill won't be installed. Other skills are only available (at least for now) in the USA. Alexa can call you an Uber or order you a pizza, but not in Canada. In fact none of the Echo devices are even sold in Canada, a ridiculous situation but easily enough overcome. Would I buy an Echo Dot again? Absolutely. I might take the plunge and buy the full Echo at some point to just have music on demand without having to connect external speakers. At a minimum I'll get another Echo Dot to expand Alexa's footprint in the house. If you're doing any home automation the Echo or Echo Dot should be something you consider. Recently a friend reached out to me for some advice on behalf of his girlfriend. Long story short: She is at the tail end of a bitter divorce and her ex used some unscrupulous tricks to try and remain in control and involved, including gaining access to her email, social media, etc. As I went through a laundry-list of suggestions it struck me that most of them were items I've written about here, however they may have lacked context. This is a real-world example of where you need to take control of your digital presence. 1) Have your computer(s), tablet(s), and smartphone all checked for remote control or logging software by a reputable source. If you suspect someone is accessing your devices remotely you need to take action. In this case the woman used Geeksquad to look around and they found some remote-access software that needed to be removed. 2) Set up 2-factor authentication for all the accounts you can. This includes gmail, facebook, etc. Using 2-factor authentication means that even if someone guesses your password they still can't get in to your accounts. 4) Use a password manager. A password manager will securely keep track of all your passwords. The good ones will also sync across all your devices and offer to make new secure passwords for new sites/services you sign up for. Personally I like Encryptr, it's secure, free, and syncs across all devices using the internet. There are others like Dashlane or Lastpass that you can use, however they tend to be subscription-based. 5) Lock down your privacy settings in Facebook. A surprising number of people have their Facebook pages open to be viewed by the whole world. There are a number of reasons this is a bad idea, including potential employers being able to view personal information you'd rather not share. In this case it means her ex could easily create a fake account and use it to keep track of her posts. Lock down your posts so they are only viewable by your friends, and review who is in your friend list. Reviewing your friend list should be an annual exercise. 6) Set up a free Protonmail account for communicating with your lawyer/accountant/doctor etc. Personally I believe everyone should do this regardless, why have sensitive information like your taxes etc traverse the internet unencrypted? For this situation it allows her to communicate safely with these professions regarding her divorce, finances, etc. 7) Install or update your anti-virus software. I've spoken with a lot of people who "used to" have anti-virus software and either uninstalled it when it expired, or just left an old version running indefinitely because they didn't want to pay for new software. 8) Start using Signal Messenger by Open Whisper Systems. It can handle all your texting. If you are sending a message to another Signal user the messages look and feel like texts, but are end-to-end encrypted. Lastly, don't be afraid to report unauthorized access to the authorities. In most places remotely accessing your hardware or accounts without your permission is illegal, and law enforcement may be able to help. It can feel overwhelming if someone more digitally savvy than you whom you previously trusted abuses that trust, but you can take control. Stay safe and happy surfing!